Save time and arrive at your destination quicker using a London helicopter hire to get you into the vibrant city of London or leave the busy UK capital behind for a weekend break in the country, avoiding traffic congestion by flying over those below. Travel effortlessly to arrive at business appointments, the Theatre or shops without worrying about travel delays, connecting trains, the stuffy Tube or parking your car by using a London helicopter hire to transport you in and out of the City. Arrive refreshed and ready to enjoy your day ahead instead of being stressed from your journey. Be where you want to be, when you want to be there, using the London helicopter hire to get you to your destination without worrying about journey times. Executives will be alert and ready to do business whilst those using London helicopter hire for leisure purposes will be relaxed, arriving in the City in the right mood to enjoy the day, having avoided the stress of travel associated with public transport and car journeys. Receive exceptionally high quality, customer-focused service, which takes care of all the little details that matter to you. Friendly and professional staff will provide you with all the information you need for a successful trip and give you free advice about the best helicopter to hire to fulfil your needs; selecting from an extensive fleet. 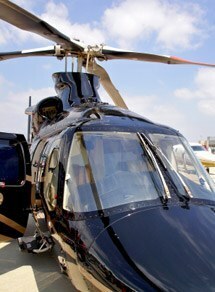 Bespoke services cater for the many different requirements of London helicopter hire clients. You will gain the maximum benefit from this hassle free point to point service and if you need transport to or from the take-off and landing sites this will be arranged for you too, so there is no need to worry about parking or finding a taxi. Make a great first impression by using London helicopter hire. Relax safe in the knowledge that your pilot and aircraft will be immaculately presented in a professional manner, with pilots especially attuned to the needs of you, your clients and guests. With the small details and travel arrangements taken care of, you can concentrate on your day ahead. The ever-increasing London helicopter market has shown just how popular, effective and efficient helicopter hire is for people who need to travel around the UK and the near continent. Please call our team on 01256 635000 to discuss your London helicopter hire requirements and solve your transport problems with one call.